All treat, no trick! 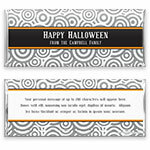 Stylish grey swirls add a note of elegance to this modern Halloween wrapper design. Design: Overlapping circle pattern with Halloween banner.